Documentary hosted by Doug Batchelor. 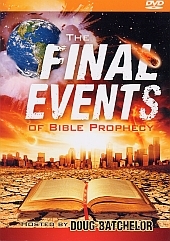 The Final Events of Bible Prophecy DVD reveals what the Bible really says about the rapture, the millennium, the second coming and more! Stunning visuals and special effects lead viewers through the last days to when the earth will be restored to it's Edenic wonder! Bonus Computer Program (English Only): Interactive Bible encyclopedia on last-day events, informative pop-ups & animations, Audio clips answer tough Bible questions.